MONTREAL -- Finding a tractor would have been easy, but Mylaine Massicotte wanted horses. After her last draft horse died last fall, the 34-year-old spent weeks combing classifieds before bringing home Jack and Alfie -- a pair of short, sturdy, Haflinger horses with their breed's signature chestnut colouring and blonde manes. 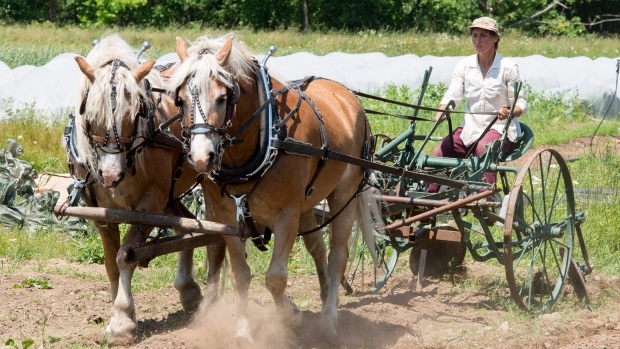 From spring to fall, Massicotte's slim figure can be seen walking or riding a small plow behind her team as she turns over the earth at Les Jardins d'en Haut, the small organic vegetable farm in she owns in Havelock, Que. She's one of a handful of small-scale farmers who mostly eschews tractors in favour of real-life horsepower, for reasons she says are both idealistic and practical. While she admits the work would go much more quickly and easily with a tractor, she says there's something to be said for partnering with an animal. "You feel a symbiosis with them, where with just a slight movement of your hand, they go where you want," she explains, sitting at a picnic bench outside her small wooden stable. "You feel they're happy to work, and willing to work." Massicotte, who did not grow up on a farm, fell in love with horses over 10 years ago after she did an internship on a farm that used them in France. And while the practice may appear old-fashioned, she says horses have practical advantages. They're less expensive to buy than a tractor, don't compact the soil quite as much, their manure fertilizes the garden and they can be fed with hay she grows herself -- although she does use a neighbour's tractor to harvest it. Few statistics exist to show how many Canadian or North American farmers use horses for farm work. While some believe the practice continues to decline, others say there has been a resurgence -- buoyed by a new generation of young farmers who are interested in environmentally-friendly and organic farming. Ken Laing, a southwestern Ontario farmer who has been farming with horses since 1979, is among those who believes the practice is on the rise. Laing and his wife and daughter run a 93 acre organic farm in St. Thomas, Ont., where they also breed, raise and sell Suffolk Punch draft horses. Laing describes horses as "solar-powered tractors," which, unlike their mechanical counterparts, can be fully fed with materials grown on the farm and can reproduce themselves. "I've never gone out to the shed and found a baby tractor," he says. Since the 1990s, his Orchard Hill Farm has taken in two or three interns every year -- generally university-educated adults from an urban background who spend an entire season learning the ins and outs of farming with horses. The first thing Laing teaches them, he says, is to understand that working with animals takes time and commitment. 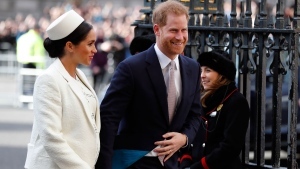 "You need to passionate about it and really delve into it, because you need to learn how horses think, and you have to be thinking a little ahead of them so they don't react to something and take you by surprise," he says. Laing believes it's now easier for young farmers to get started with horses than it used to be, thanks to internship programs like his as well as books and resources available online. But Massicotte still finds it hard. As one of only a handful of farmers in Quebec who uses horses, she sometimes feels isolated, with nobody nearby to turn to when she needs advice. Sometimes, she struggles to train Jack and Alfie, who only pulled sleighs and carts before she got them and can be temperamental at times. Since few companies manufacture modern agricultural tools for horses, she's trying to design her own with the help of a machine shop in town. At times, she admits the tractor beckons. But for now at least, she's not giving up. "What I really want is to improve with the horses," she said. "Maybe if I can improve enough, and develop the right tools and talk about it, other people might join me."